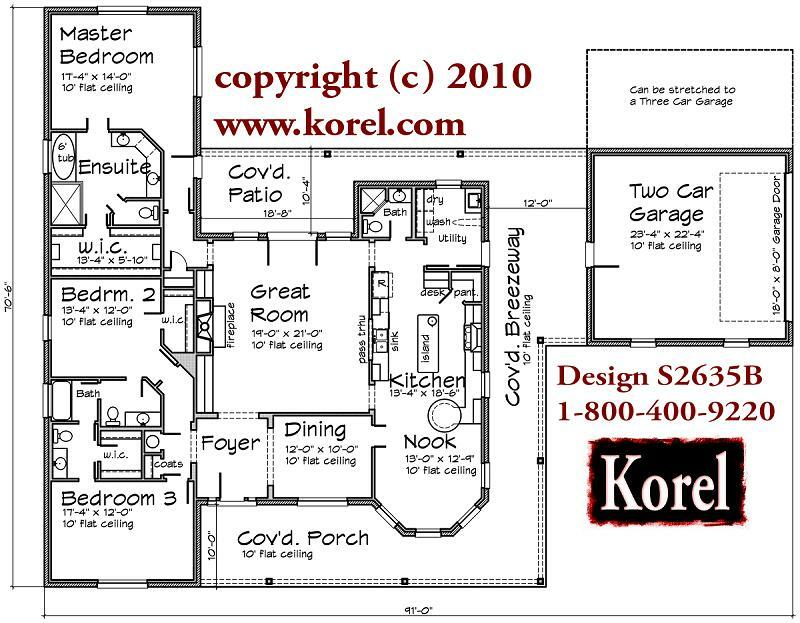 This is one of our most popular Country Homes with a wrap-around Porch and related to our plan S2635A. All three Bedrooms have Walk-In-Closets. Bedrooms 2 & 3 have a Jack & Jill Bath. The Guest Bath in over near the Utility Room and has a shower. The Master Ensuite has a 6′ Spa Tub, large 42×60 shower and Double Vanities. Your Great Room/Family Room has Built-in Cabinets on both sides of the Fireplace. Your Island Kitchen has a 36 stainless steel Range with an Old World Vent Hood, large Pass Thru at the Sink into the Great Room and a circular Eating Bar at the Breakfast Nook. Your Garage is oversize at over 23′ deep. The Garage Door is 18′ wide x 8′ Tall. The Garage can easily be stretch to a Three Car if you so desired. The thing most people like about this plan is the Wrap Around Porch. The 12′ wide Breezeway is an outdoor room by itself. All ceilings are 10′ flat. You can easily have a higher/vaulted ceiling in the Great Room. The Roof Pitch is an affordable 8:12 slope.